Maybe it is because of some experiences I had growing up, but as a parent, I never considered that sending my kids to a Christian college was necessarily going to be a "safe" option. I went to the public high school. I knew where a person could get alcohol or pot, I heard plenty of talk about promiscuity, yada, yada, yada. I had no assumptions that my teachers were Christian, however many of them really did keep my faith from crumbling. But the religiously affiliated high school? You went to those kids if you wanted serious drugs, and it always seemed that the teachers and students would talk more about religious issues, but it never felt to me that it was in any way affirming or uplifting. 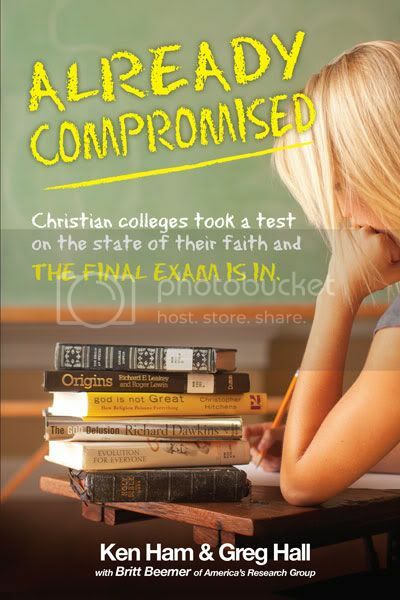 Christian vs. secular colleges didn't seem much different. My public university ranged from indifferent to hostile when it came to Christianity. But it is where I found my way back to God. Friends at Christian colleges seemed to find the attitude towards Christianity to be wishy-washy and confusing. That's, well, ummm, two or three decades ago. I have assumed that the situation hasn't improved. The book Already Compromised by Ken Ham and Dr. Greg Hall confirmed that. It didn't shock me or surprise me, not really. Except maybe that I'm surprised that parents still seem to think that your average Christian college is going to be an uplifting spiritual experience for their children. That doesn't mean I don't think the book was worth reading. America's Research Group studied 200 Christian colleges and universities in 2010, asking questions of the presidents, vice presidents, and heads of the science and religion departments. The polls touched on a lot of issues, particularly involving scripture and faith. Do you believe in God creating the earth in six literal 24-hour days? 78.8% said yes. Do you believe in God creating the earth, but not in six literal days? 42.3% said yes. Assuming 0% of the presidents believe that God didn't create the earth, you're still left with far too many college presidents who believe that the earth was created in six days and that it wasn't created in six days. How is that possible? Like I said above. Wishy-washy. The first half of the book is talking about the study and the results. The state of Christian colleges in America. The second half of the book is an action plan: what can the Church do, what can parents do, what can students do. We've always told our girls that going to a Christian college was not necessarily a safe environment. In fact, I prefer that they would attend a conservative secular college.